Perhaps it’s because I have little kids but Rev Rec sounds like something Scooby-Doo would say when he sees a ‘ghost’. For financial leaders, the new Revenue Recognition guidelines is definitely a “Ruh Roh” moment. Changing the way your business recognizes revenue has wide ranging impacts across the entire organization. This in turn affects the way your employees are bench marked, evaluated, incentivized and ultimately paid. 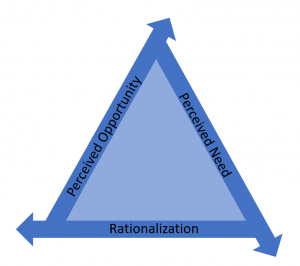 According to the fraud triangle, there are three factors that explain why an employee commits fraud – perceived financial need, perceived opportunity and rationalization. Drastic changes to commission structures and evaluation metrics could create both a rationalization (“this isn’t fair for me”) and a financial need (“I am not making the same money as last year”). Your company’s T&E system presents the perceived opportunity. T&E Compliance teams should consult internally with the Audit department to determine the level of risk at a company level. If the risks are high then identify the employee groups most impacted by the changes. T&E auditing could be increased for 2018 on these groups to monitor for the most common fraud schemes. Expense report issues could be an indicator of a larger scheme that also impacts Rev Rec rules. You can find information on how ASC 606 & IFRS 15 might impact your industry here. The financial impacts are generally the greatest for software companies, especially SaaS based software companies with revenue streams that last many years instead of a single one time purchase.